Chief Engineer Jonathan Finch had gone missing after a powerful railroad tunnel explosion and the ensuing investigation has forced the company to freeze all work on the track. As the main investigator, you discover that the collapse may not be related to natural events, but rather a mysterious and ancient civilization. 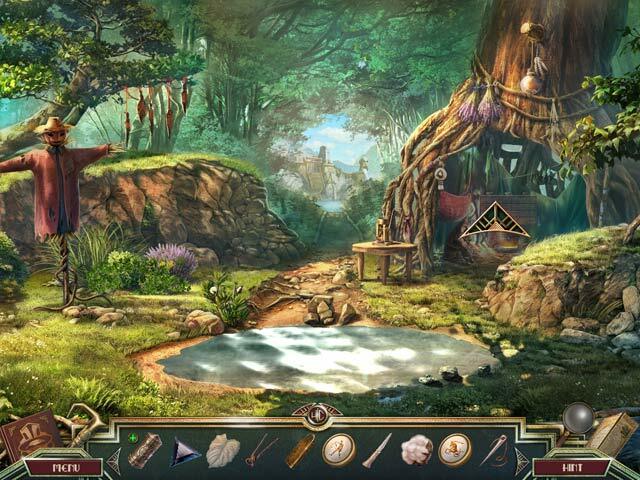 Can you dig up the truth in this hidden object mystery? Sacred Almanac: Traces of Greed is rated 3.6 out of 5 by 25. Rated 5 out of 5 by smilingsun72 from Adventure with no HOS. A hidden gem in its own right! Complete: This is a great game to keep one busy for a few hours. It has an interesting story and great graphics. There are a variety of mini games and no HOS. There isn't any voice acting so the text has to be read. The map allows for quick travel and shows places of interest. The music score is perfect for the games theme. I really liked this game. It was not fancy by today's BF standards but that didn't bother me. I liked that the story was not dark and gloomy. And there wasn't any creepy moments. Though it's the good guy getting the bad guy there wasn't anything magical. Just good old follow the clues, pick up items, and solve puzzles along the way...kind of like the early 1920+ era I believe this story is set in. Rated 5 out of 5 by Robcol from Brave Developers More like this please, this was great, very entertaining, challenging, I loved it. Rated 5 out of 5 by SparkleGlow100 from RELAXING, NATURE-FILLED GAME. MOUNTAIN STREWN DESERT AND CAVES** *******NO HOPS********* You are out West. WAY OUT WEST. Traverse desert, mountains and rock formations. You can almost feel the dry heat beating down on you. Then continue on to underground caverns. Many water scenes feature too. GREAT SCENES OF THE NATURAL WORLD; you start off indoors, but that doesn’t last long. The 3 screenshots chosen to highlight the game really don’t do the game justice. The video gives you a better idea. Even then, that makes it seem more like a crazy, action-packed game, and it really isn’t. Took me somewhere between 2.5 to 3.0 hours to complete in one evening. However, I skipped a lot of the puzzles. GRAPHICS: WONDERFUL: SHARP, DETAILED, PERSPECTIVES ARE RIGHT. Metal looks like metal, rock looks like rock. The metal is worn and peeling and rusty in places. Realistic with natural colors. It doesn’t matter to me how it is achieved, it looks fantastic! FILLS THE WHOLE SCREEN. HOPS: NONE PUZZLES: Lots, a variety of types and difficulties, with some being very difficult. SOUNDS: 3 - Music is ok and has a separate control. I found that if I adjusted volume say for ambient, then mouse-click would also change too. Luckily this didn’t affect music, which I silenced after 10 minutes. Good ambient sounds. HINT: 20 seconds to recharge on casual and the Hint will lead and guide you. Note there are no glimmers/sparkles even on Casual, but the cursor does change shape when there is an item of interest. DIFFICULTY LEVELS: 3 not interchangeable. MAP: TRAVEL and has useful indicators. INVENTORY: Lockable JOURNAL: YES CHARACTERS: Infrequent interaction, since you are in the middle of nowhere. However, you do come across the local inhabitants/mountain tribe and you have to gain their confidence by passing their tests. NO voice-overs, you read. So glad this was on the $2.99 daily offer! Who knows when I might have found it otherwise! Rated 5 out of 5 by anca13 from Great Graphics..............Fun to play. After downloaded the trial, I played for 30 min. and decided to buy immediately. (of course the price today was great) The map is very handy. After finding items (without HOP) they made definite sense. I play always without music so I cannot weigh that. However, I love the graphics and the story is smooth. I think it a relaxing game. Definitely a buy today .!! Rated 5 out of 5 by jcsgame from Excellent SE Game This is NOT a HOS game, It is an Adventure Game, but not an extremely difficult one. The HINT setup in this game is very good and will aid you through the game, if you need it. Give this game a try, you might enjoy it. The graphics are very clear. Even through there aren't any voices, the game is still interesting and moves along well. Rated 5 out of 5 by ethan1404 from Excellent mid-week game! Wow! Thank you BFG for a fantastic mid-week offering .. it not only offered enjoyment, but I was able to buy it with one of my coupons. This game was great, no hidden objects to have to plow through, was purely based on the gamer being able to work out what needs to be found and used, yahoo! I have often said, HOP segments are put there as an excuse to find an object that needs to be used ... well, not with this game! Every step you take you need to find a reason why, an object to use and whilst not overly hard, tackled the mind! And to boot, not a game where you finally had to go back lots and lots of scenes whereby you had forgotten even that something had to be done as it was so long ago, in other words, too much tooing and froing! This game is challenging, enjoyable, only about 5 scenes of going backwards and forwards in each segment, but still makes sense! No stupid HOP moments (Elephant, Eepix, etc. take note!) to go through, just a wonderful, smooth, intelligent, and adventurous game! A true adventure game but unlike others, no hours of listening to dialogue either! 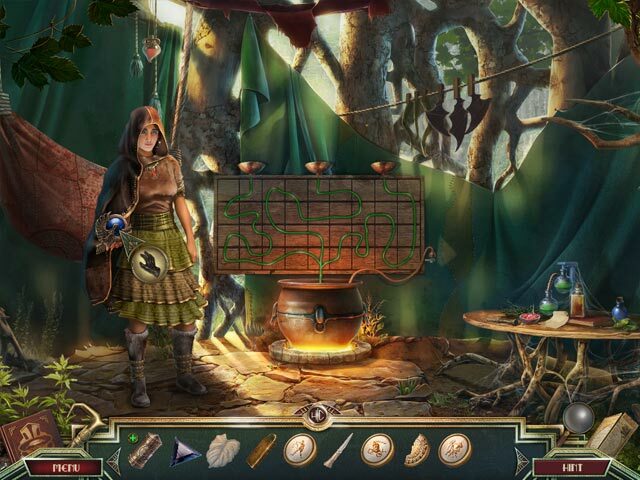 This game also was of a good length, unlike some of the well known games which seem to be getting shorter but still cost, has a storyline and a fun, challenging factor for those who like their games without a million hidden object moments. To be fair though, these are becoming a little different, a bit more amusing, but for some reason, still necessary! Why then can a game like this come out, be challenging, interesting, fun, absorbing, with not a single HOP? Perhaps methinks easier to do this to find a required object, eh? To all who read first and see if they would buy a game, I highly recommend this if your genre is a bit of challenge, a fun game with hard but not too hard puzzles, and with a bit of patience and perseverance, can be solved, no HOPS, a good storyline, cheap and even free with a coupon, then definitely get it! Rated 4 out of 5 by ninja226 from HO adventure without junk piles This game is off the beaten path, but a hidden object game minus the junk pile HOPs and NO voiceovers. I found it a refreshing change to read the narrative and dialogue instead of having voiceovers imposed on you. The music has just the right balance of soothing with a hint of adventure. There is plenty of video cut scenes. The action is in finding objects among the scene to progress to the next task. There are helpful messages to guide you even in Expert mode. Most actions are logical or intuitive. The puzzles are mostly easy, with the last two being a bit tricky, but do-able with persistence. If you hate junk piles, this game is right up your alley. I thought it was a well done game with a decent plot, good graphics, and oddly mesmerizing background soundtrack. I recommend a look, if not a buy. Rated 4 out of 5 by Ashleaves from Too Short I thought this game was a lot of fun. It is not a HOG. There are absolutely no HOS. My issue with the game is it only took me an hour and a half to complete. It lets you completely use up the 60 minutes of free trial and then I bought to only have 30 min of game play left. So sad. Fun concept though. I wish they made more like these, instead of big junk piles you have to sift through to find random objects you don't even use.